Your loved one has been diagnosed with Alzheimer’s or Dementia- NOW WHAT?! When a person with Dementia finds that their ability to remember is declining, they often feel vulnerable and in need of reassurance and support. The people closest to them- including their family, friends and caregivers- need to do everything they can to help the person retain their sense of health, identity and feelings of self-worth. As the disease progresses, caring for someone with Dementia becomes increasingly more difficult. Join us and discover facts about Alzheimer’s and Dementia. 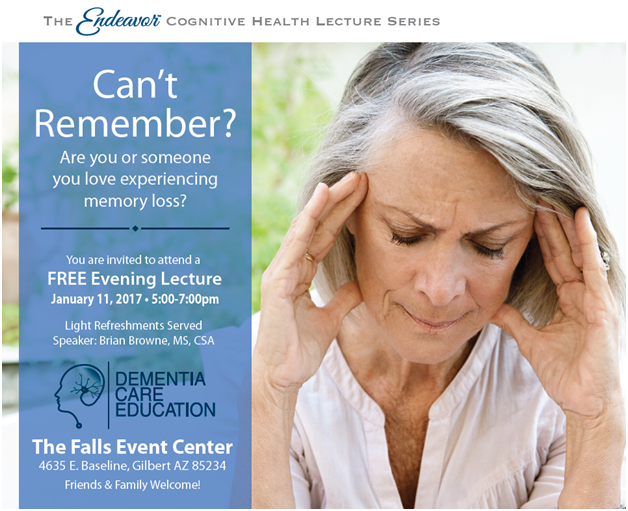 The Endeavor Cognitive Health Series is back and will be offering a FREE morning lecture on Friday, January 6, 2017 from 10:00am to noon at Leisure World in Mesa (908 S. Power Rd., Mesa, AZ 85206) Brian Browne, MS, CSA will help attendees discover how common Dementia symptoms can be managed as well as coping techniques and other caregiver strategies to help you and your loved ones find success. Light refreshments will be served and this lecture is available to the public and all friends and family are welcome. Please join us for this lecture to learn more about cognitive health from an industry expert. Seating is limited so please RSVP by calling 480-498-2324. Please contact us for any questions on future topics in this lecture series. Does nutrition play a role in the prevention of Alzheimer’s? Researches across the world are racing towards a cure for Alzheimer’s disease. But as the prevalence rates for Alzheimer’s increase, the focus of research has broadened from treatment to prevention strategies. It has been discovered that it may be possible to prevent or delay the symptoms of Alzheimer’s disease and other dementias though a combination of diet and nutrition. 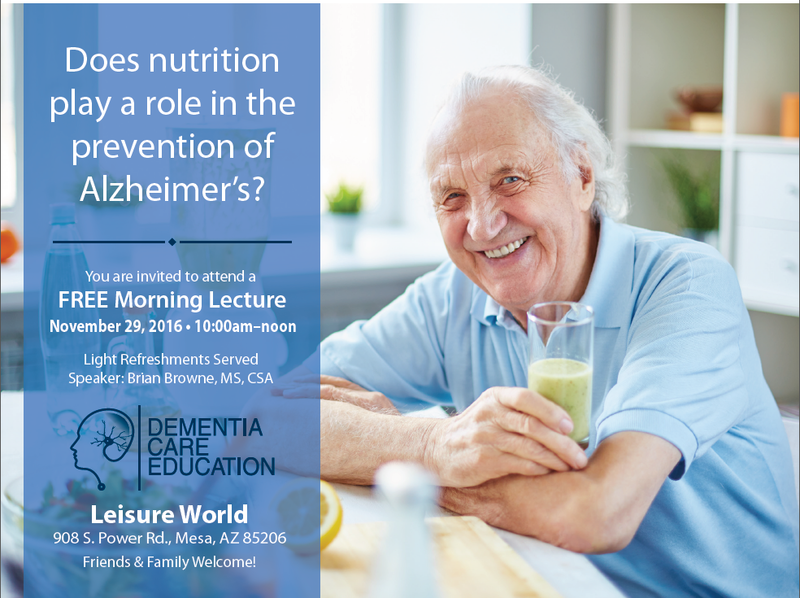 Join us and learn more about how what you eat and what you do can reduce the risk for Alzheimer’s. 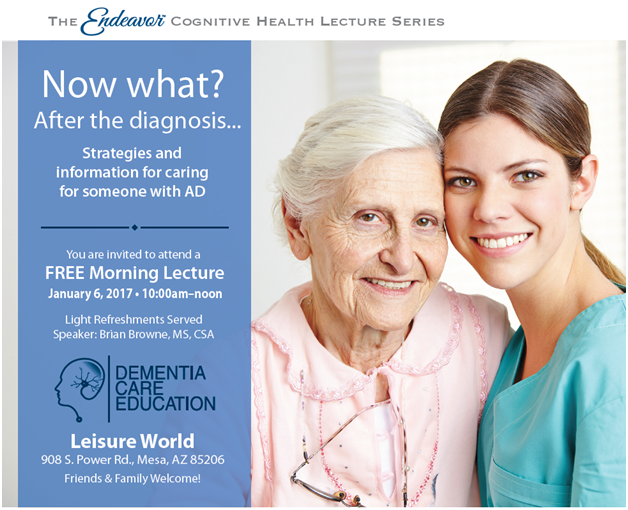 The Endeavor Cognitive Health Lecture Series continues on Tuesday, November 29, 2016 from 10:00am–noon at Leisure World in Mesa (908 South Power Road, Mesa, AZ 85206). At this FREE morning lecture we will hear from Brian Browne who will offer cutting edge research and information from an industry expert’s point of view. This lecture is open to the public and there will be light refreshments served. Our lecture speaker, Brian Browne MS, CSA, directs education and community outreach initiatives within the science, business and lay communities. As the Director of Education and Outreach at Banner Research and President of Dementia Care Education, he creates partnerships as he interprets dementia and Alzheimer’s science for the community. The Endeavor In-Home Care team brings this Cognitive Health Lecture Series to the public and welcomes anyone interested in receiving more information on the various topics. This will be the last lecture until we begin again in January 2017. Please contact us for the future topics that will be in this lecture series. There is limited space available for the lectures so please RSVP by calling 480-498-2324. Communication is an integral part of the human experience. It is vital for quality of life and for maintaining self-identity, yet it’s not uncommon for individuals to experience communication deficits as they grow older, especially when memory loss is an issue. Senior in-home care services can help you meet your loved one’s basic needs, allowing you to focus on the quality of your visits with him or her. 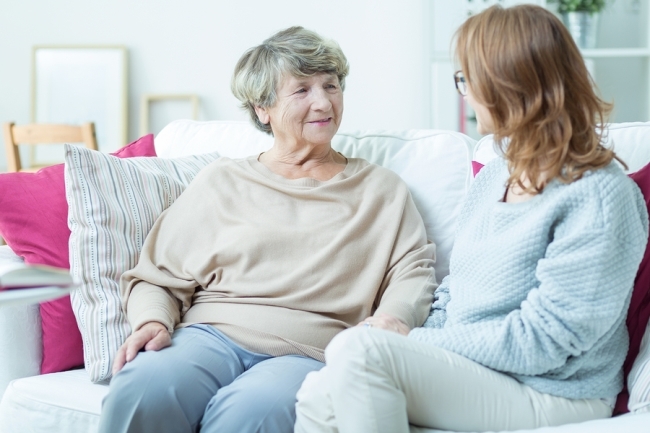 While visiting, try a few simple tricks to improve communication despite your loved one’s Alzheimer’s or other form of dementia. It’s important to avoid letting stressors influence your communication with your loved one. Spend a few minutes taking deep breaths and calming down if something is troubling you. When you’re ready, make sure your loved one is focusing on you. You may need to eliminate distractions, such as by turning off the radio or television. Make eye contact with your loved one before you speak. It’s best to use short, simple sentences and to avoid any sort of complexity. If you’re asking questions, for example, ask only one question at a time. If you need to repeat your words, be sure to repeat the exact same words you previously used. Speak slowly and calmly, pausing briefly after each sentence to help your loved one process the information. Give your loved one plenty of time to respond when you are finished speaking. Pay attention to non-verbal cues when trying to interpret speech, such as your loved one’s facial expression and body language. If your loved one says something that you know to be untrue, avoid contradicting him or her because this will only cause anxiety. Let your loved one express his or her feelings without trying to interject false humor or joviality into the conversation; it’s all right and even beneficial for your loved one to express sad feelings. Listening respectfully shows your loved one that you care. 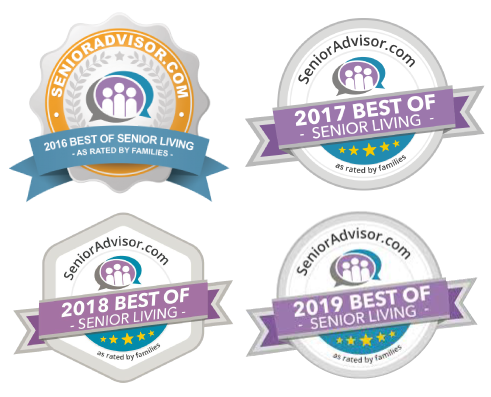 Endeavor In-Home Senior Care is the leading provider of senior in-home care services for families in Mesa, AZ. In addition to our companion care, post-operative care, and hospice support services, our rigorously screened caregivers also provide specialized dementia and Alzheimer’s care. If your loved one could benefit from some extra help to maintain independence in his or her own home, call our senior in-home care agency at (877) 584-6162.